For parents Adam and Melissa Winch, there was nothing harder than having to leave their struggling premature baby, Axel, behind in a Aurora, Colorado, hospital. Thanks to a team of kind local police officers, though, they made absolutely sure the infant wasn’t alone in his battle for survival. Melissa Winch, a police officer in her small city of Grand Junction, Colorado, experienced the hardest weeks of her life when she gave birth to son Axel at just 29 weeks’ gestation on July 29, 2017. Doctors at their local hospital struggled to figure out what was wrong with the tiny baby, who on multiple occasions died in his parents’ arms before being resuscitated during his first few weeks after being born. 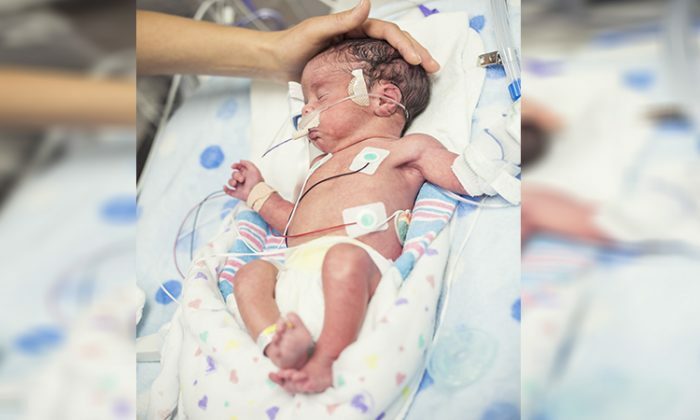 Genetic malformities left the premature infant, born at just 2 pounds and 12 ounces (approx. 1 kg), without his sight or hearing initially and with a laundry list of other health problems that left his chances of survival slim at best. His skeletal structure was frail, and his lungs were far underdeveloped even at 29 weeks when he was born. His brain lacked proper development, as well, and suffered multiple bleeds that left him needing surgeries in his already-weakened state. The Winch parents took as much time off of work as they could, flying with Axel to Aurora, Colorado, where a larger hospital was better equipped to address his numerous health concerns. His surgeries and the steroids he took to help speed up his lung and brain development were all supervised at the Children’s Hospital in Aurora, while his parents stayed at his side day after day. A former Grand Junction police officer who worked in Aurora took notice of the Winches’ struggles. He immediately went to work setting the family up as best as he and his department could, finding them free lodging and paying their bills back home for a full month. In time, though, neither Melissa nor Adam could miss any more work—so, in what was now the hardest moment in their harrowing journey, the parents had to say goodbye to their son and leave him at the hospital in Aurora and head home. Their devastation was apparent, but the Aurora police department didn’t want Axel to be alone. So they set up a “Cuddle Watch,” imploring members of the department to sign up for shifts to stay with Axel in the hospital and snuggle him in his parents’ absence. Sergeant Mike Pitrusu, head of the Aurora police employee health and wellness department, was the brains behind the incredibly touching police operation. All in all, about 20 officers signed up in a rotation to sit and snuggle with Axel, taking pictures of the growing infant—who was defying all medical odds and surviving despite the chances he’d been initially given. They wrote in a journal for his parents, recording his life so Melissa and Adam didn’t have to miss any more than they already were. The officers sang to the baby and read him stories, providing him with more love than one tiny person could ever hope for. To them, though, the cuddles were as therapeutic as they were beneficial to Axel. Which, of course, can’t be understated; by mid-November 2017, Axel was able to return home to his parents, where he began gaining weight and developing both his sight and hearing. The Winches claim that Axel never wants to be put down now, but they have no problem with that. For their miracle child, there’s nothing sweeter than the realization that he may actually be okay after all. Axel's parents stayed by his side in the NICU for months after he was born, but they eventually had to go back to work. Aurora Police didn't want him to be alone, so they formed the "cuddle watch."